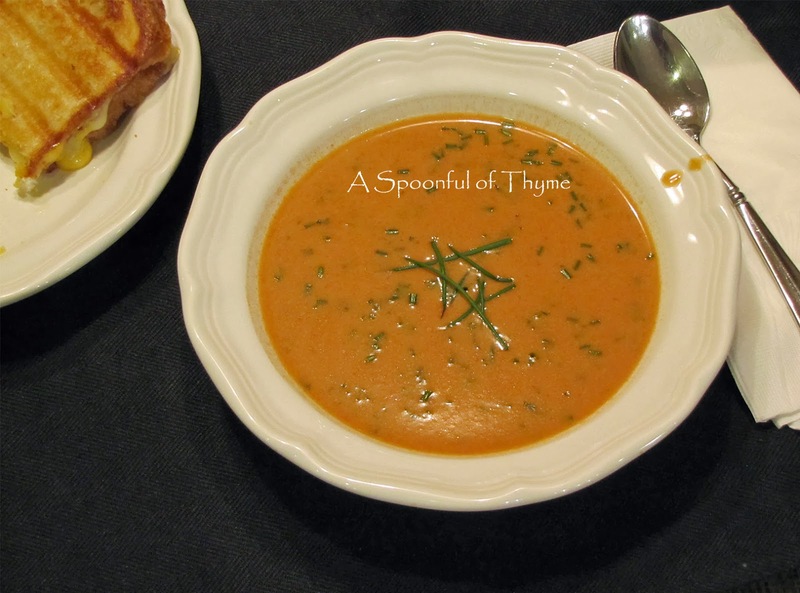 My favorite soup, when I was growing up, was Tomato with crackers crunched up and mixed in. I loved the creamy tomato and the way the crackers soften just a tiny bit and sort of softly crunch on those first few bites....nothing better on a cold day...unless of course, a toasted cheese sandwich is added. What a heavenly lunch! I still love tomato soup but one day I was served some that was just a bit fancier! It was Tomato Romanoff Soup....I was immediately in love. The soup was served at a popular luncheon house in town that raises money for the local Child Guidance Guild, hence the name, Guild House. I found the recipe in the Guild House Cookbook and enjoy it often. 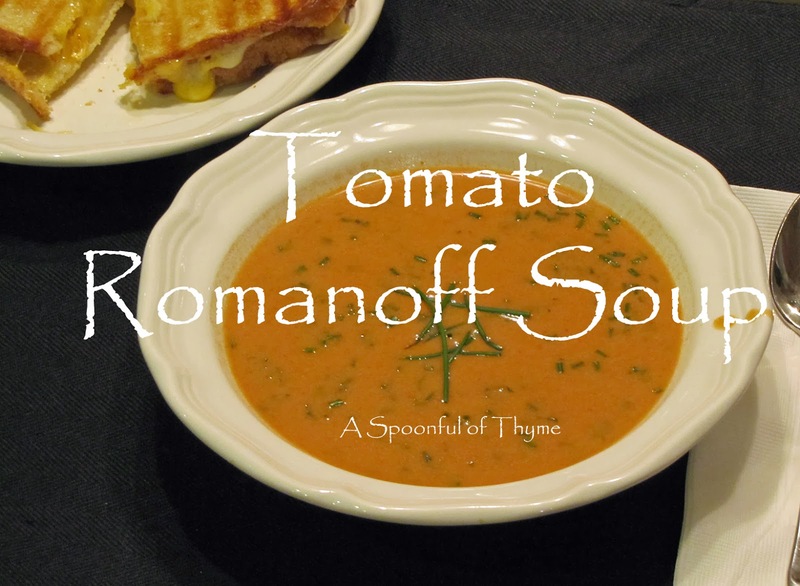 I was curious about the name and what made regular tomato soup become Tomato Romanoff...well, it is all in the name...and the addition of a few ingredients. I can only conjecture that this was one of the popular recipes that was served at Romanoff's in Beverly Hills. 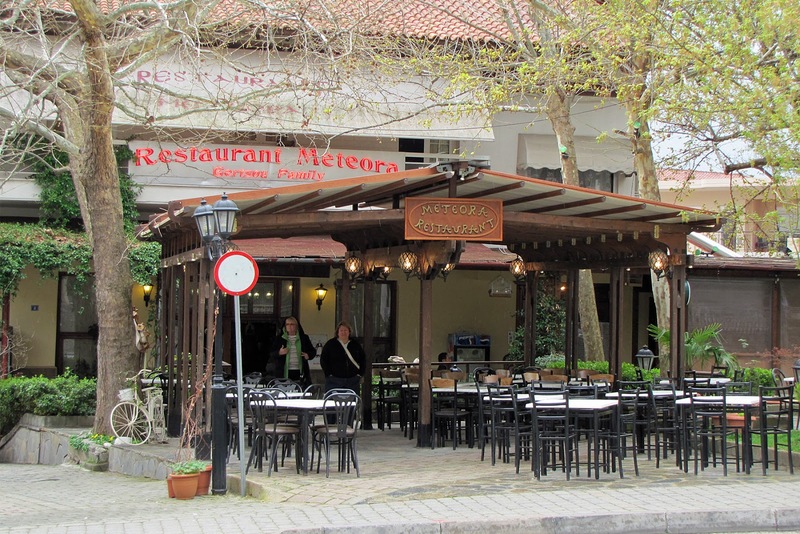 The restaurant was opened in 1941 and quickly became the place for celebrities to go and be seen. Michael Romanoff was born Hershel Geguzin in Lithuania, the son of a tailor. Hershel Geguzin aka Harry F. Gerguson aka Michael Romanoff, a self-proclaimed Prince (Prince Michael Dimitri Alexandrovich Obolensky-Romanoff, nephew of Tsar Nicholas II), had grand ideas and was most anxious to make his way in the world...which he did, as a restaurateur, conman and actor. Prince Romanoff was very popular on the Hollywood scene and sported his trademark spats, moustache, and walking stick as he made his way around town charming everyone, living in hotels and borrowing money from his wealthy pals! Who is to say if this recipe is a Romanoff Restaurant original....but it was fun to do a little research and I know I enjoy this soup! Mix soups, sour cream and sherry in saucepan until perfectly smooth. Add green onions, chopped parsley and celery salt. Heat to a simmer. I am sharing today at Foodie Friday hosted by Michael at Rattlebridge Farm. 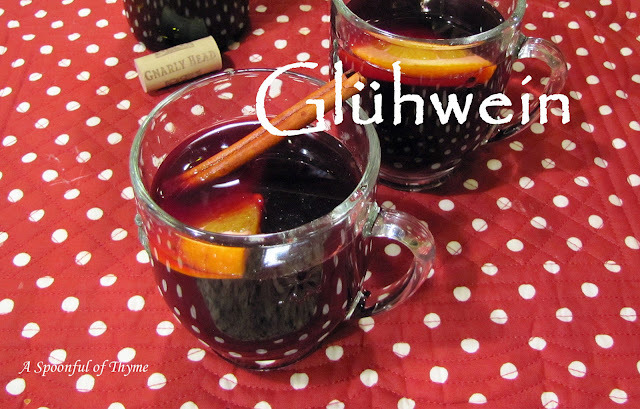 Take the Chill Off with a Cup of Glühwein! 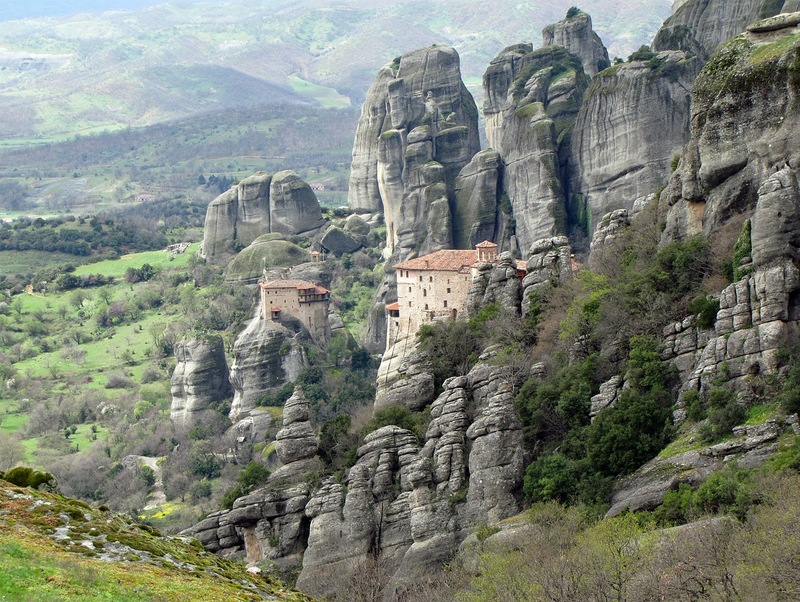 Traveling in Europe during the fall can be quite a chilly adventure. Leaving husbands at home last fall, my friend and I had a wonderful trip that took us from Prague to Paris! 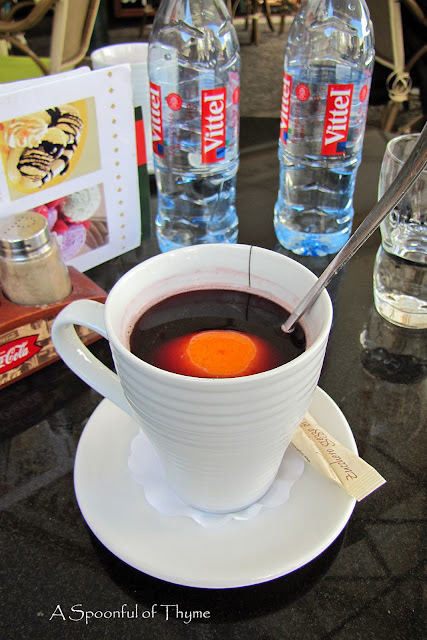 On a chilly day in Prague we stopped for lunch and had to have some "hot wine" or Glühwein to warm us up! 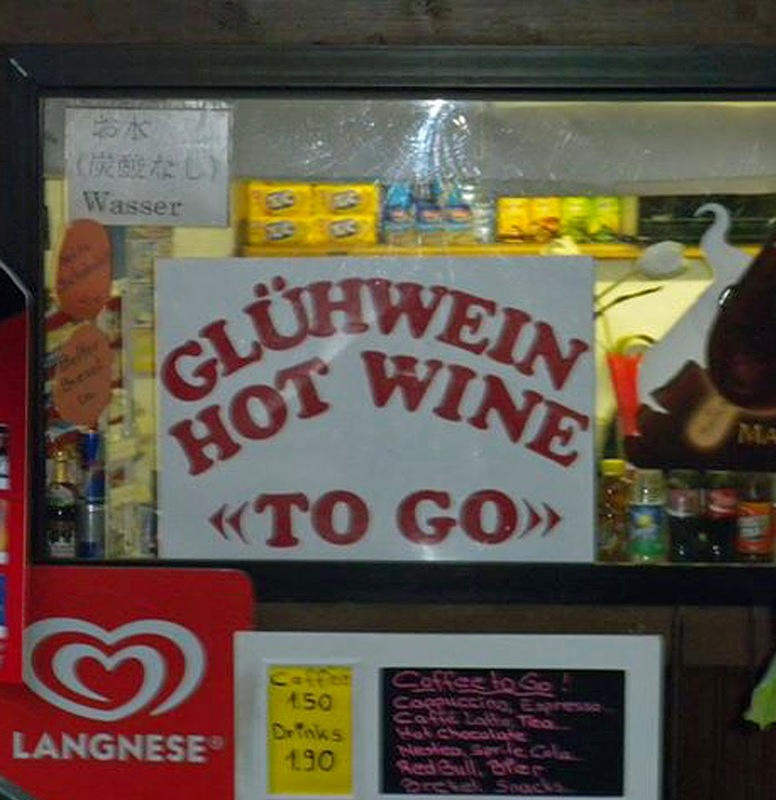 Glühwein is quite popular and we saw advertised everywhere. In Heidelberg, Germany it was advertised "to go"! 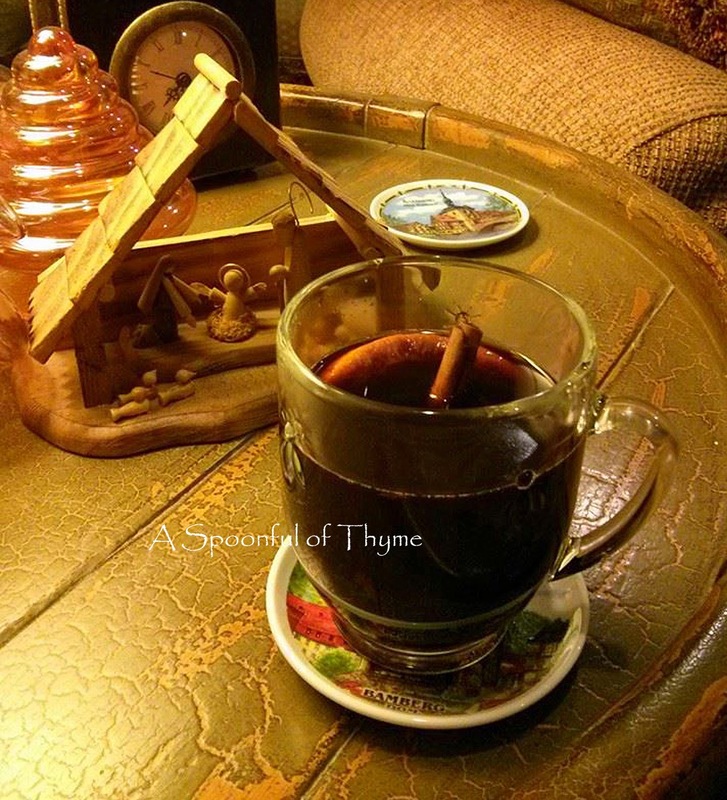 I have tried many recipes over the last year trying to recapture the wonderful aroma and flavor of my first cup of Glühwein. Glühwein is a drink that can be made many ways and it is really a matter of taste. I have made it using a Cabernet Sauvignon, a Merlot and a Zinfandel. The Zinfandel seems to be the best choice for me...the deep fruity flavor is perfect combined with the other ingredients. I used my friend, Cathy's (Wives with Knives) recipe and made just a few adjustments. Slowly hear the wine being careful to not bring it to a boil. Remove the zest from the oranges and the lemon. Add the citrus juices and zest to the wine along with the spices and sugar. Simmer for five minutes and then let the mixture stand for an hour. Strain the mixture and then reheat to serve. Garnish the cup of Glühwein with a half slice of orange or a twist of lemon....and a cinnamon stick, just for fun! This is certain to warm you to your toes! I am sharing at Foodie Friday hosted by Michael at Rattlebridge Farm. 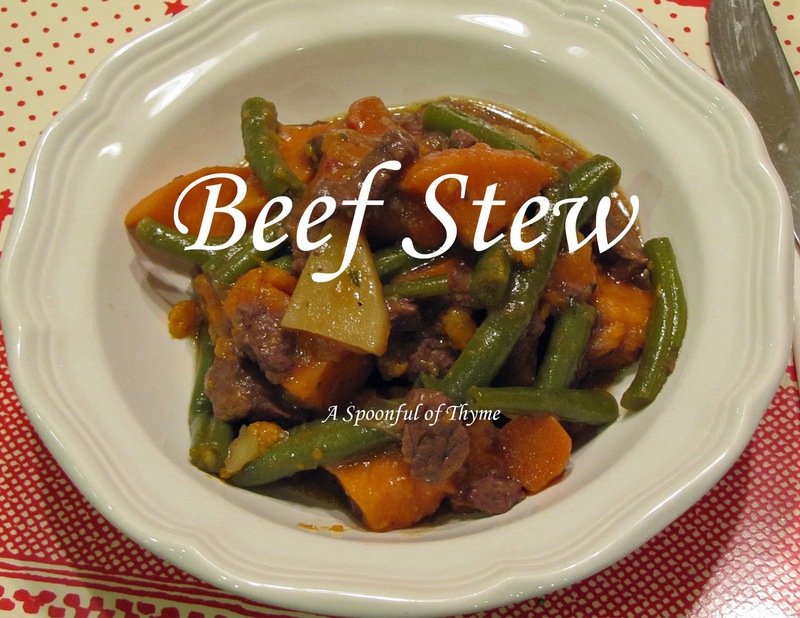 After a long day and evening of shopping, nothing hits the spot better than a bowl of Beef Stew! I have always liked beef stew but I had never really searched around for a good recipe. I made stew like I had growing up....it really wasn't that great so I rarely made it. 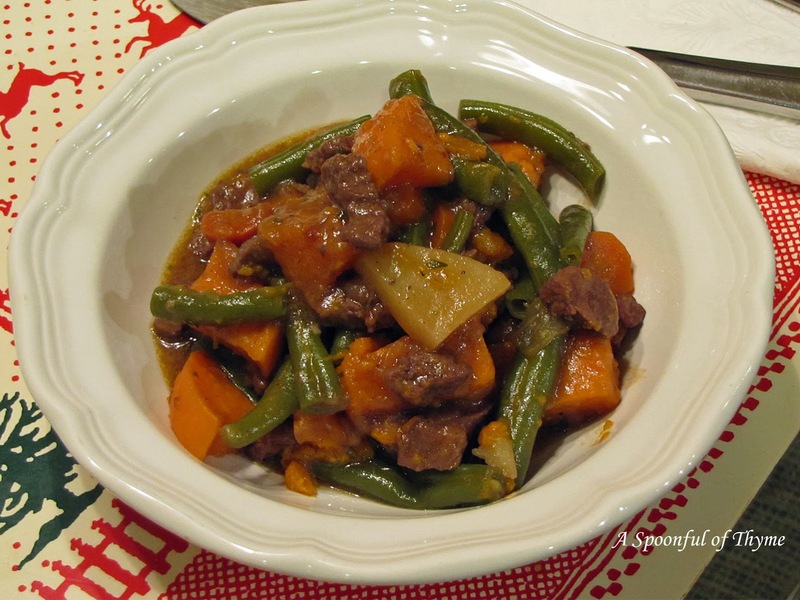 I had a package of beef that had been cut for stir fry so with a little more cutting, it was in small cubes that would be perfect for beef stew. Stew meat is never quite tender enough for me so I usually cut up a sirloin or get the stir fry cut. This recipe comes from Cook's Illustrated cookbook, Cover and Bake. I really liked being able to do a little work on the stove top and then popping it in the oven. We were really pleased with the results. I had to make a few adjustments to match what was in the pantry but it didn't effect the results. I didn't have two red potatoes. I only had a russet potato and a sweet potato so that is what I used. Heat the oven to 300° F. Place the beef cubes in a large bowl. Sprinkle with salt and pepper; toss to coat. Heat 2 Tablespoons of the oil over medium-high heat in a large non-reactive kettle. Add the beef in two separate batches. Brown the meat on all sides, about 5 minutes per batch, adding remaining oil as needed. Remove meat and set aside. Add onions to the kettle; saute until almost softened, 4 to 5 minutes. Reduce heat to medium and add garlic; continue to saute about 30 seconds longer. Stir in the flour; cook until lightly colored, 1 to 2 minutes. Add wine, scraping up any browned bits that may have stuck to kettle. Add stock, bay leaves, and thyme; bring to a simmer. Add the meat; return to a simmer. Cover and place in the oven. Simmer for 1 hour. Remove the kettle from the oven, add the potatoes, carrots, and green beans. Cover and return to the oven. Simmer until meat is just tender, about 1 hour. Test vegetables for doneness. Remove stew from oven. Note: I suggest checking the amount of liquid in the pot. You may prefer more broth in your stew. If so, I would consider increasing the flour and liquid by one half. ...or add some beef stock, as I did. This was delicious the night we served it and even more so the next day. Yummy! I rarely make pancakes. I remember the first time that I made them. It was on cooking day in my junior high home economics class. I was excited as this was something that I would know how to cook for my parents for Saturday breakfast....it was a total disaster. We were having the district Superintendent visit our classroom and he was going to eat pancakes with my cooking station....I repeat, total disaster. Sadly, the pancakes were burned on the outside and raw on the inside. How embarrassing is that? From that day forward I knew that I could not make pancakes and the few times that I did make an effort, I had a similar disaster...so being paranoid about it, I crossed them off of my list. That is until this year...I kept seeing and reading about pumpkin pancakes. That said I decided that I was now should be grown up enough to make a pancake that wasn't burned and raw! Preheat griddle or 10-inch skillet to medium heat. In a large bowl, whisk together the dry ingredients: flour, brown sugar, baking powder, salt cinnamon, nutmeg, ginger and cloves, set aside. In a medium bowl, whisk together the wet ingredients: milk, egg, vegetable oil and vanilla extract. Pour the wet ingredients over the dry ingredients and whisk gently until combined. Set aside for five minutes. Once the griddle or skillet comes to temperature, brush vegetable oil on the surface. Wipe off any excess with a paper towel. Ladle 1/3 cup of the batter onto the griddle for each pancake. Do not crowd the pancakes. Cook for 2 to 3 minutes, or until the edges are set and the bubbles around the edges are open and set. Flip and cook on the second side for an additional two minutes or until golden brown. Serve immediately. 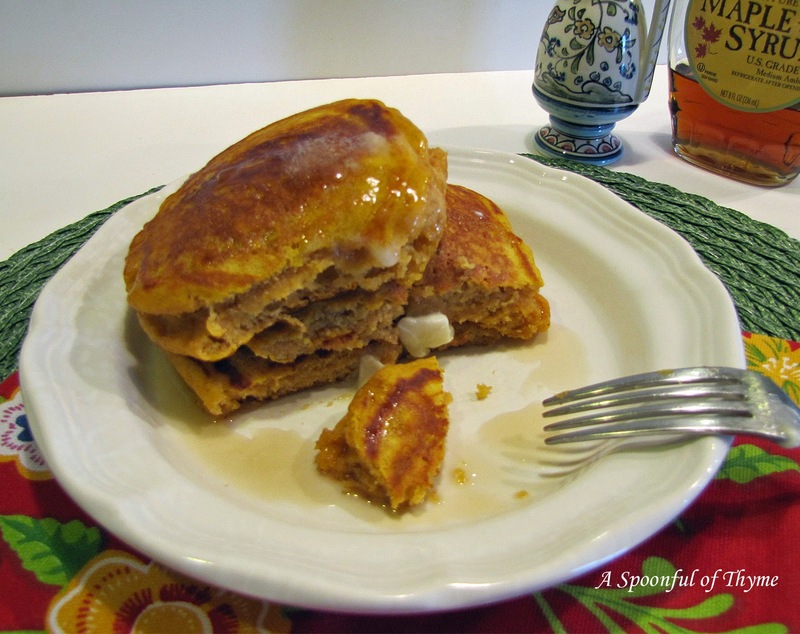 Leftover pancakes can be frozen for up to one month. 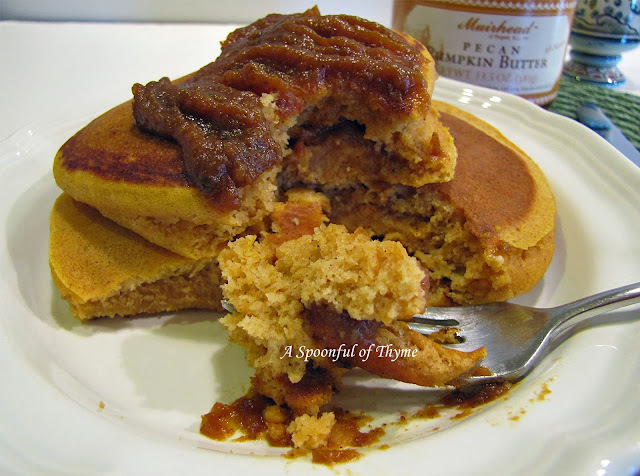 The pancakes were served with a choice of maple syrup or Pumpkin Pecan Butter. Either way was delicious! What prompted me to brush the paranoia aside and try to make pancakes, was The Secret Recipe Club. I was assigned Danielle's blog, Mostly Food and Crafts. 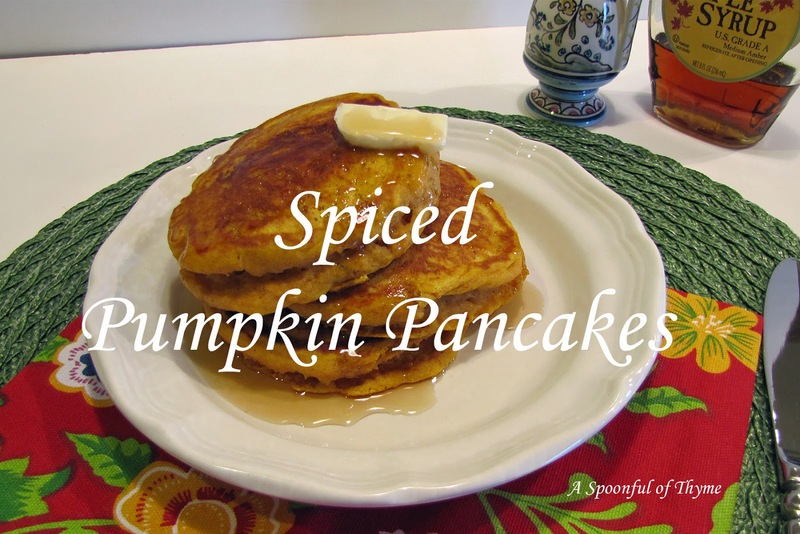 As I perused the breakfast recipes on her blog I spied the Spiced Pumpkin Pans. Surely I could make them if her daughter could! I was ready for breakfast...I was ready for pumpkin...I was ready for...pancakes...I was inspired...and I am very happy that I was. 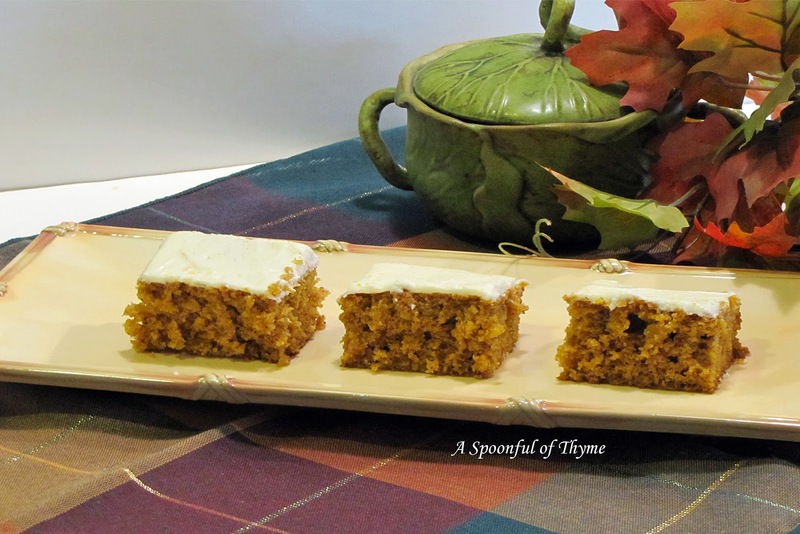 I did make some adjustments to the recipe as I didn't have any pumpkin spice in the pantry and I only wanted to make a small batch. My daughters who always told me that their grandmother's pancakes were the best...certainly would not say that about these...move over grandma. You have competition. 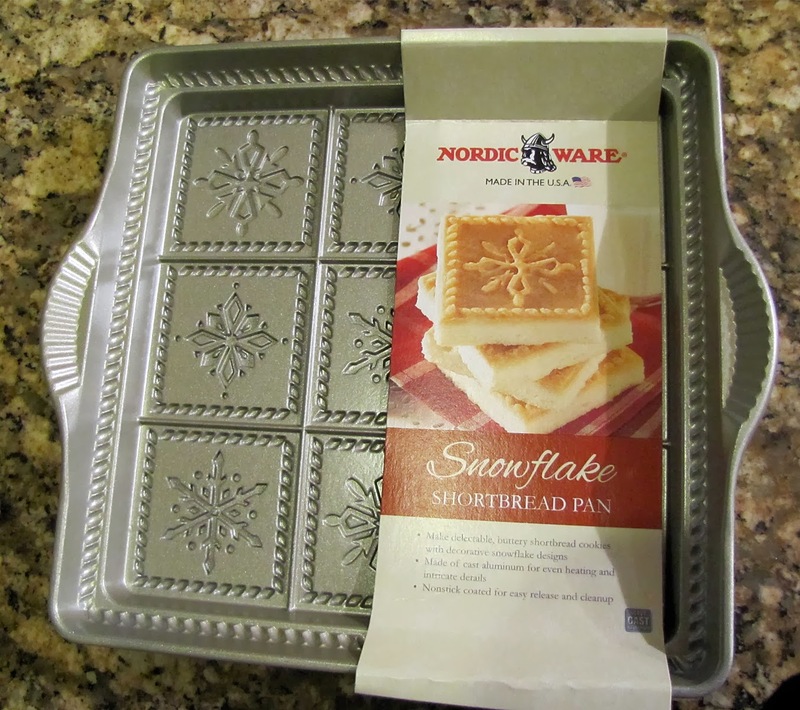 My New Snowflake Shortbread Pan and Its Maiden Voyage! I have been really slow about getting into the kitchen for Christmas baking. I had thought that just maybe I wouldn't do any this year....I have a sweet tooth and figured if it wasn't in the house I wouldn't eat it. Then I decided that I have will power! Limit of one! Preheat the oven to 325° F. Grease the pan lightly. Bake for 30-35 minutes or until lightly browned. (Mine was lightly brown and moving from the sides at 27 minutes.) Let cool in pan for about 10 minutes. Loosen the edges with a plastic knife and invert onto a cutting board. Cut into serving pieces while warm. 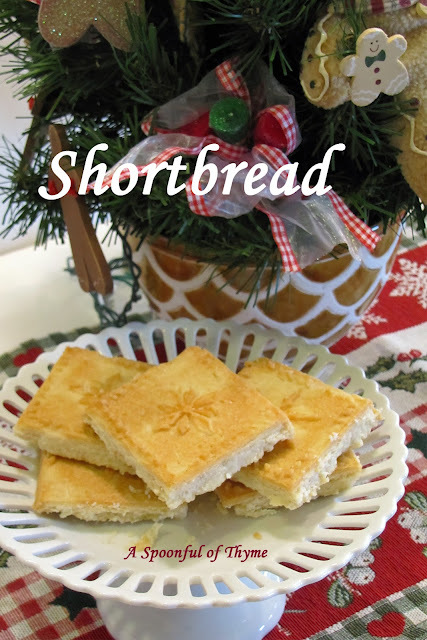 The shortbreads were light and delicious. It was a successful maiden voyage. I have butter on the counter so that I can make some more. Thank you ladies for sharing your successes! I am always looking for that special vegetable dish around the holidays. Something a little different and distinctive. I think I found it! Fine Cooking featured this recipe just before Thanksgiving and I had to give it a test run! You probably recall that I most of my life I have had an aversion to anchovies....I think it started with my dad always having anchovies on our pizza. That is truly a good way to RUIN a pizza! I overcame the aversion when I made Shrimp and Pasta Puttanesca. I realized that the anchovies just add an intriguing layer of flavor. 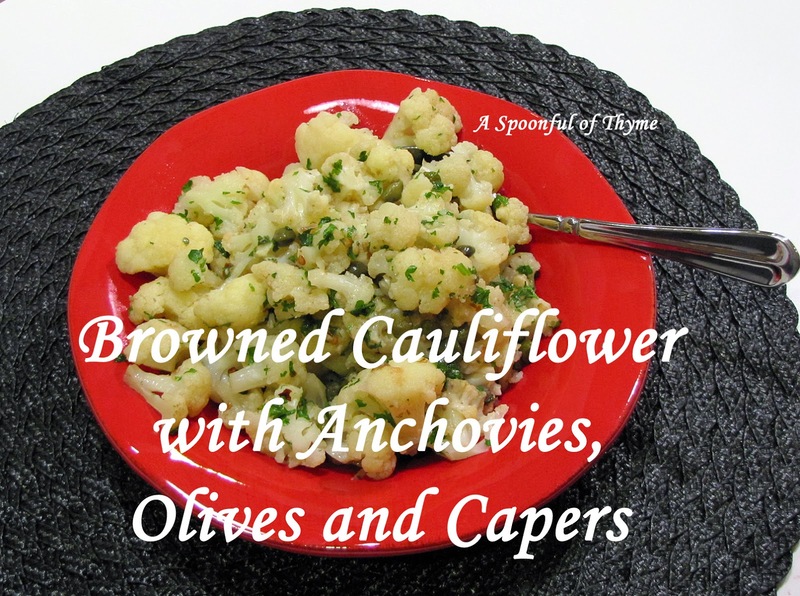 The same happened with this lovely cauliflower dish...it was delicious with layers of flavor. Prepare the cauliflower by cutting individual florets. Cut the large florets into quarters, medium into halves, leaving the small florets whole. Make a paste by mincing the garlic, salt and anchovies together. (Mash with the flat side of a knife until they become a paste. Or use a mortar.) Scrape the mixture into a large shallow bowl. Add 1 tablespoon of the olive oil, the olives, lemon juice, capers, lemon zest and the red pepper flakes. Stir well. Heat 2 tablespoons of the olive oil in a heavy 10-inch skillet over medium-high heat. When the oil is hot, add half the cauliflower pieces in a single layer, flat side down. 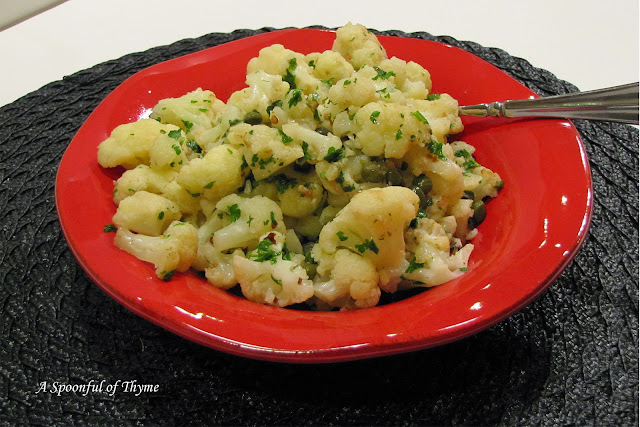 Cook the cauliflower until well browned on the bottom, 2-4 minutes, and then transfer to a plate. Add the remaining one tablespoon of oil to the pan and repeat with the remaining cauliflower, but do not transfer from the skillet. Return the first batch of cauliflower to the pan, turn the heat down to low and carefully add 2/3 cup water. Cover and let steam until the stems are just tender, 6-8 minutes. With a slotted spoon, transfer the cooked cauliflower to the bowl with the anchovy mixture. Add one tablespoon of the cooking liquid. Let sit 1 minute to warm and loosen the mixture, and then gently to coat the cauliflower and evenly distribute the olives and capers. Serve warm or at room temperature. We decided that this was a lovely dish and excellent vegetable for a special meal! I seem to be on a role at the moment....during the fall I saved so many recipes that I wanted to try and I am finally back in the kitchen and having the pleasure of trying them out! This particular recipe comes from one of my favorite blogs, The Cafe Sucre Farine. 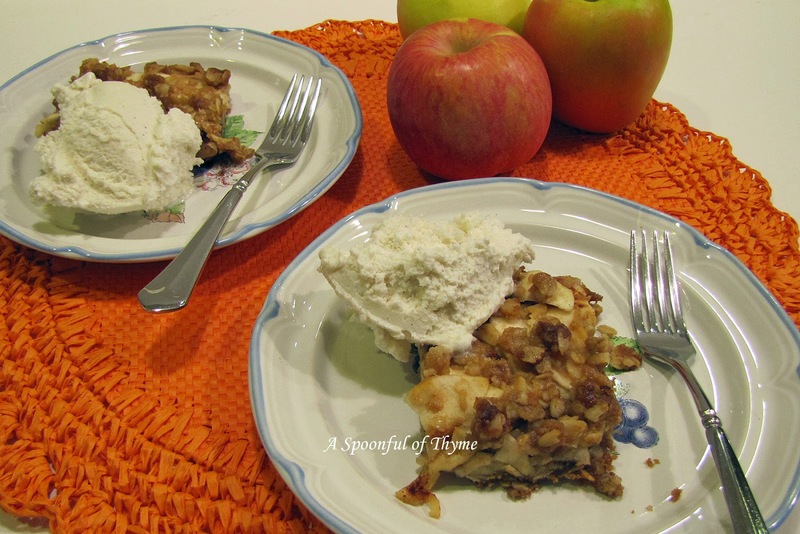 Chris has so many tempting recipes on her blog that I can hardly keep up! Earlier I made her Mediterranean Chicken with Tomatoes and Cannelini Beans. It has become a hands down top favorite of ours. I also enjoy reading about her grandchildren and their many special times together. Mr. T. raved about this dish and I know it will be requested again...really tasty and worthy of repeating! I hope you enjoy your time at A Cafe Sucre Farine...it is a lovely place to visit!! 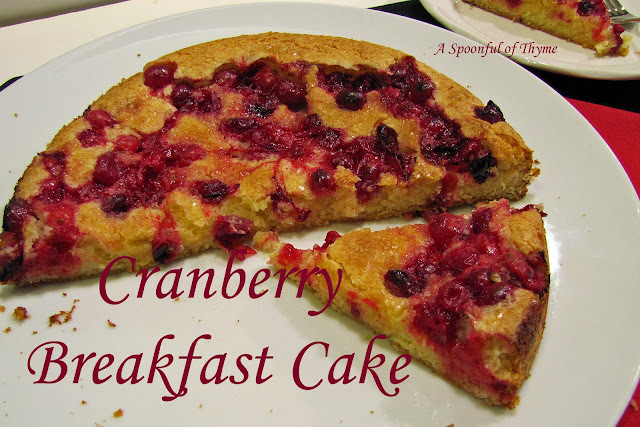 On Thanksgiving morning I wanted to make some Spiced Pumpkin Pancakes...but I also wanted to make this Cranberry Breakfast Cake. 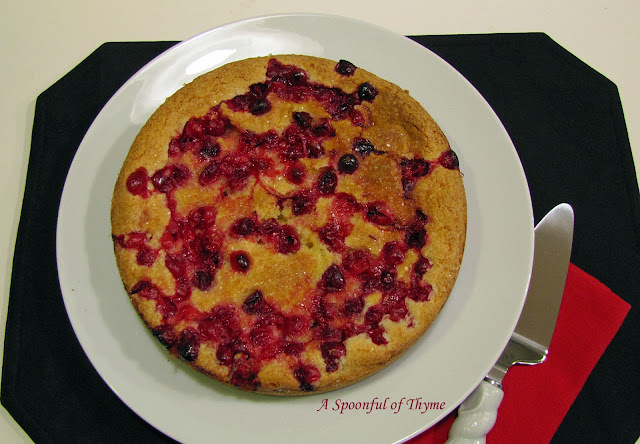 The cake won...for its simplicity and I love cranberries and had to try it! I saw the recipe for this Cranberry Cake on Stacey Snacks. She raved about how simple and delicious this cake is, she even made two and froze one for Christmas...she had me convinced, and here it is.... Stacey had a great blog and prepares many delicious meals...I so enjoy reading about her cooking adventures. Stop by if you have a chance. Grease a 9" springform pan or a 9" tart pan with removable bottom. Mix the butter and sugar. Add the almond extract and eggs, combine well. Spread the batter into the prepared pan. Press the fresh cranberries into the top and sprinkle with the two tablespoons of sugar. Bake for 35 minutes. Let the cake cool in the pan before removing the sides. I like that it is not a very sweet cake. A slice of this breakfast cake was perfect with coffee this morning....yum! For the Love of Cranberries!! 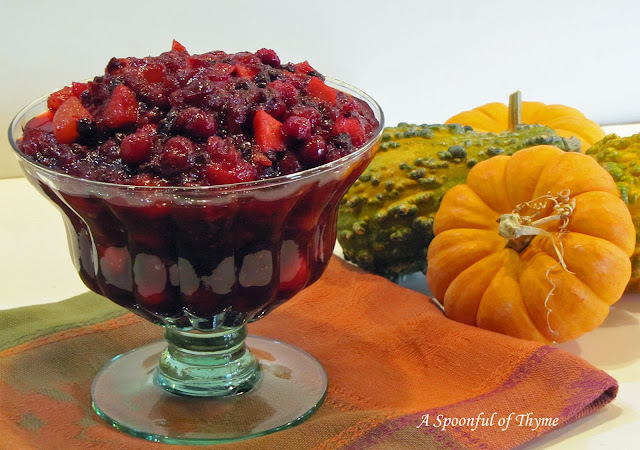 When I was growing up we always had the usual can of jellied cranberry sauce with our Thanksgiving dinner. It wouldn't be Thanksgiving without the jellied cylinder that has little rings (indentations) around it...I remember being sent to the store and coming back with whole cranberry sauce....one would think that the world was coming to an end...we had to eat the "wrong kind". Dad was rather particular, I guess. Things didn't vary much....when I got married and had my first Thanksgiving dinner away from home, we had cranberry sauce made from a bag of fresh cranberries. I remember thinking how great it tasted....of course, they also served the jellied cranberry sauce as there was another dad who was particular. When it was my turn to host Thanksgiving dinner I knew that I was going to be a bit more adventurous...I actually made two different kinds of cranberry sauce and a chutney....and, yes, a small can of jelled cranberry sauce for those who are not adventurous! Today, I realized that I have only posted one my tried and true, old favorite cranberry sauces and chutneys....and guess what? Since there were no pictures of them, they won't be posted this year, either! 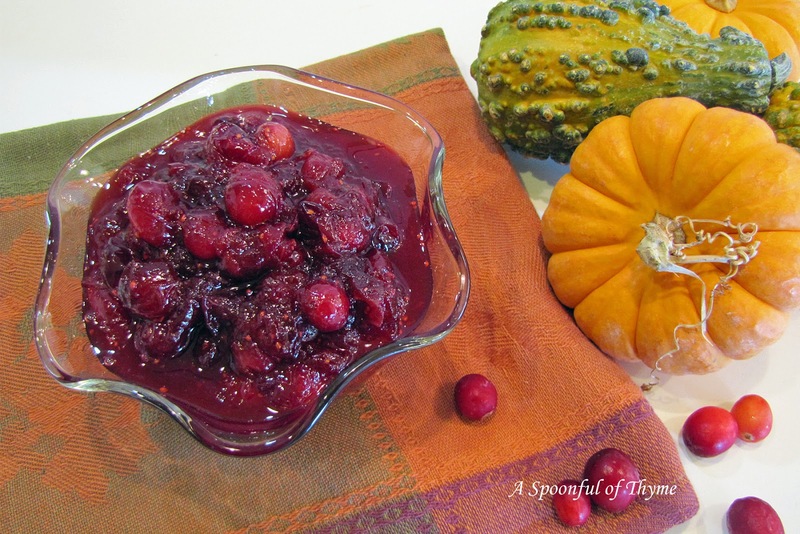 BUT, I did just finish making a new cranberry sauce recipe and I am happy to share it. I found it on Sam's blog, My Carolina Kitchen. 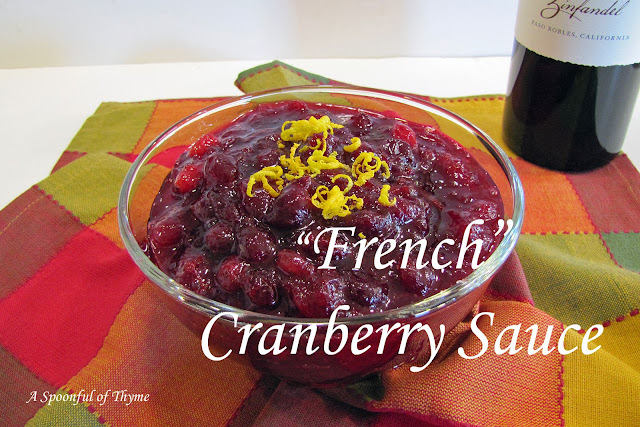 She posted a collection of cranberry and chutney recipes...I made her "go to, favorite" recipe that she dubs My Carolina Kitchen's "French" Cranberry Sauce. I have been sampling all morning so I know why it is her favorite!! 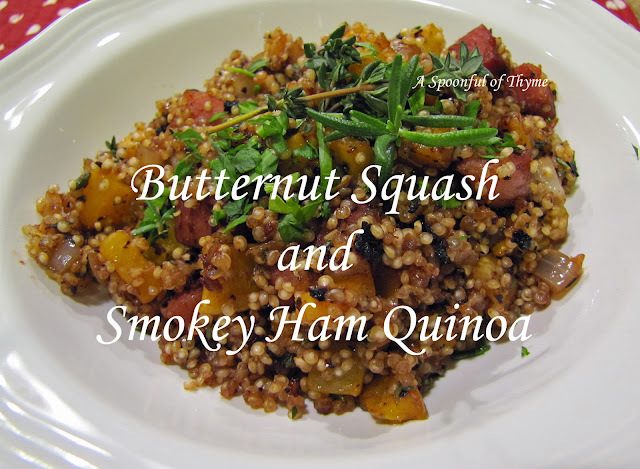 Sam has an excellent blog with super recipes...I have made many of her dishes and they are always perfect!! If you haven't paid Sam a visit, you will want to....soon! I think I should change the name to "California" Cranberry Sauce based on the wine location...but I want Sam to have full credit for her recipe!! So here is the California "French" Cranberry Sauce!! Put the cranberries (fresh or frozen) in a sauce pan with the cinnamon sticks, red wine, and sugar. Zest and juice the oranges. Reserve half of the zest for garnish. Add the remaining zest and the juice from both oranges to the cranberry mixture. Stir the cranberry mixture and bring to a boil. Let the mixture simmer (about 15 minutes) until the cranberries have burst. Remove from the heat, let cool, and discard the cinnamon sticks. The sauce will set as it cools. It can be refrigerated, covered from up to five days. Just before serving, garnish with the remaining fresh citrus zest. Serve at room temperature. 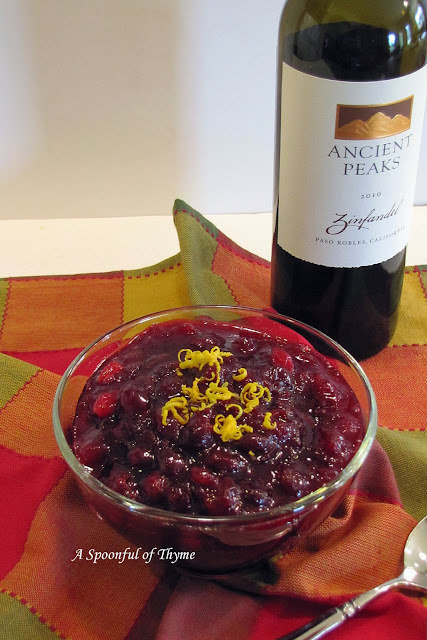 I do want to share the two other cranberry recipes that I have posted. Spiced Cranberry Chutney with Oranges above, is the perfect balance between sweet and tart. It does make a large amount so count on feeding the neighbors or consider cutting the recipe in half. Last year I tried this Orange Maple Cranberry Sauce. It was one that I sampled all morning long...I wasn't disappointed in this simple addition to our Thanksgiving table. I am so thankful for all of the wonderful men and women I have met through my blogging experience. 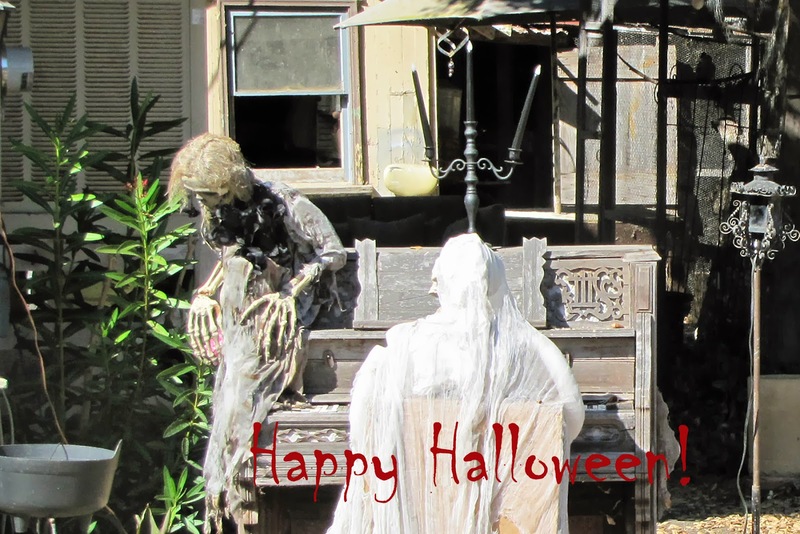 Thank you all for your visits, comments, and help! 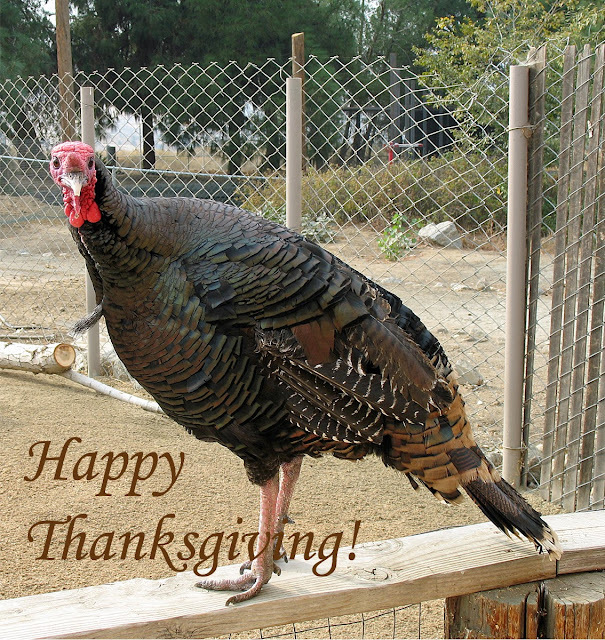 I hope each of you has a very Happy Thanksgiving! This is the last chance to get things planned, organized and ready for the best feast of the year! To me the Thanksgiving meal is the very best....a time of gathering family and friends together to give thanks for our many blessings and to enjoy the very best cooking of the year! In preparation and motivation for the feast, I read through many of my favorite blogs...saving recipes that I thought would be perfect for the season and the big day. 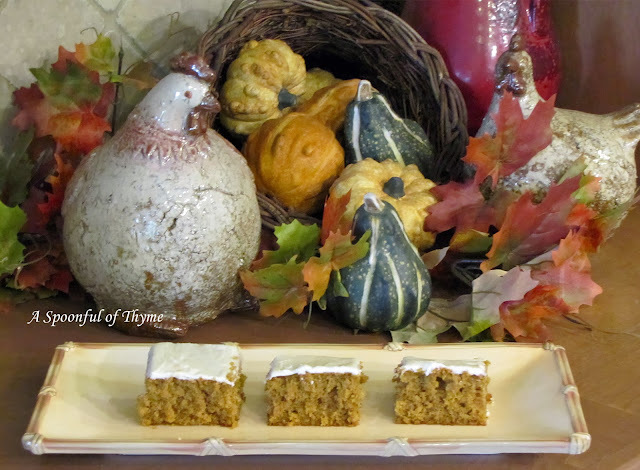 When I read Monique's post about the pumpkin bars that she had just made and dubbed, KILLER Pumpkin Bars, I knew that I had to make them. Monique's blog, La Table de Nana, is one of the first that I started to follow...she has a lovely blog that is filled with inspiration along with amazing recipes....do visit her...you will love the tour....thank you, Monique for sharing. These are the type of bar that cannot live long in my house...they were plated and delivered to others...continuing the journey.... 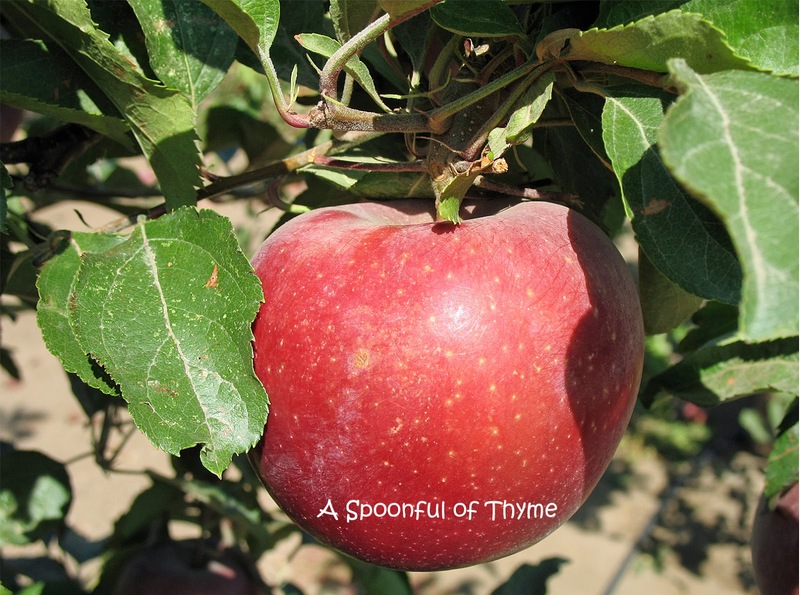 They are easy to make and worth adding to your seasonal menus. Sift the flour, baking soda, spices and salt together. Set aside. Cream the butter and sugar until smooth. Add the pumpkin and eggs. Beat until well combined. Bake for approximately 25 minutes...until the center of the cake springs back...or the tester is clean. Beat until smooth and frost the bars. Mr. T ate quite a few of these delightful bars. 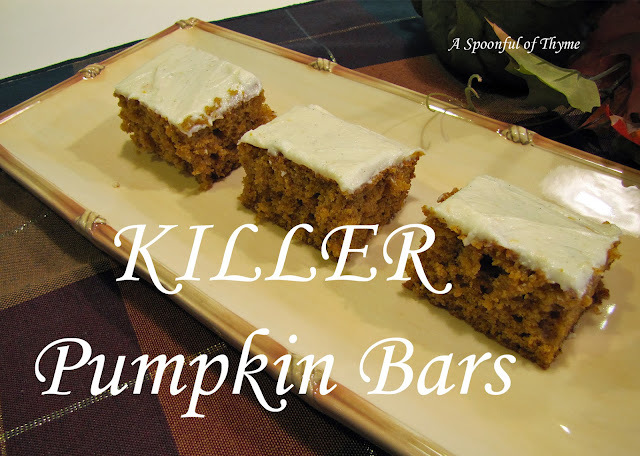 I know that the KILLER Pumpkin Bar recipe will be on my "forever" list. A package came in the mail from my daughter and guess what was inside? Among the tissue I found a new cookbook and an amazing set of new measuring cups! Yippee! I love new things for the kitchen...and the measuring cups include measures such as 2/3 and 3/4 as well as the regular measures; and, they are labeled on the handles with both the standard and the metric measure. Their short handles are so easy for scooping..I love them!! 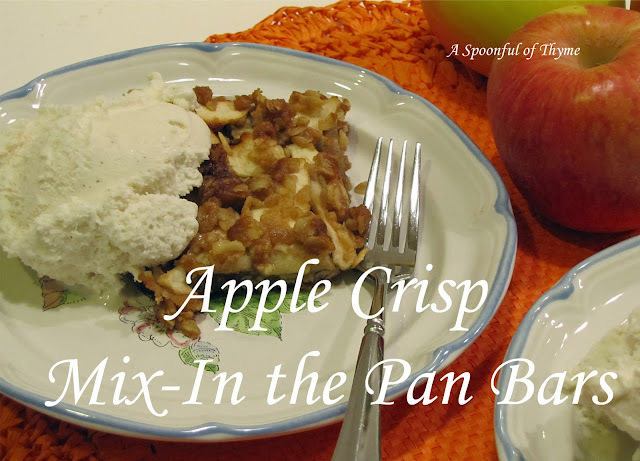 When my daughter was visiting she wanted to make the Apple Crisp Mix-In the Pan Bars...who cares that it is late in the evening...we had apples so, why not? Place the oven rack in the middle. Preheat to 375° F.
Combine the oats, flour, brown sugar, 1 teaspoon of the cinnamon, the salt, and the baking soda directly into a 13 x 9 inch baking pan. Add the butter and stir until moistened. Reserve 1 cup of the crumbs and set aside. Firmly press the remaining mixture into the bottom of the pan. Spread half of the apple slices evenly over the crust. Sprinkle 1 Tablespoon of the sugar, the lemon juice, and the remaining 1/4 teaspoon cinnamon over the apples. Layer the remaining apples and then sprinkle the remaining sugar over the top. Scatter the reserved oat mixture over the apples and cover the pan tightly with foil. Bake for 30 minutes to start to soften the apples. Remove the foil and continue to bake until the oat topping is golden and the apples are tender, about 30 minutes longer. I am sharing with Full Plate Thursday hosted by Miz Helen's Country Cottage and Foodie Friday hosted by Michael at Rattlebridge Farm. Sometimes it is nice to have something a little different for breakfast. 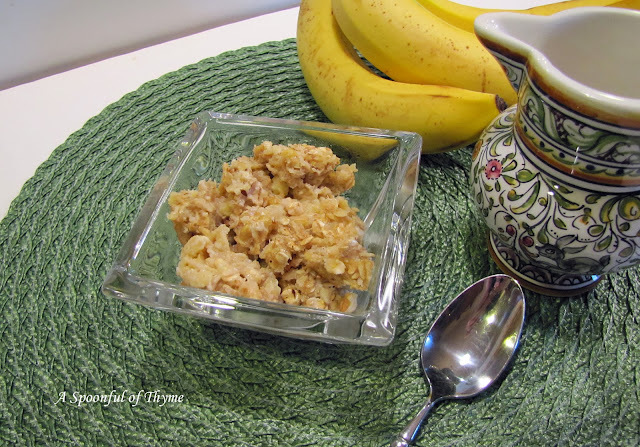 That is just what I was looking for when I saw a post on Noble Pig for Banana Oatmeal Bake. 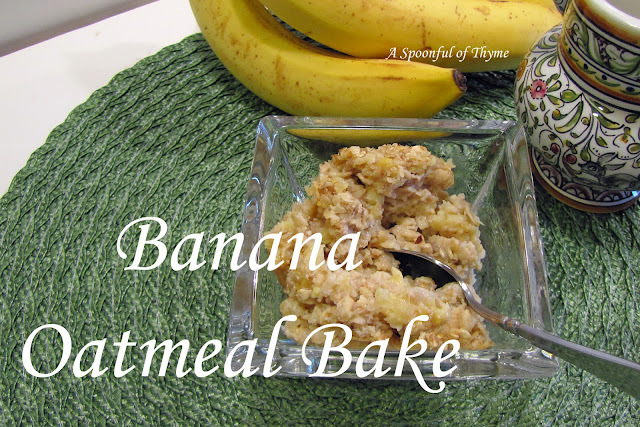 Cathy posts some amazing recipes so I knew that this was going to be delicious and perfect for our busy morning. With a wonderful banana bread aroma wafting through the house, I could hardly wait for the minutes to tick away and the timer to ring. I poured a bit of milk over the top and enjoyed each and every bite! I also knew that it was going to be loved by Sabine. Yes, my granddaughter has been here and she loves bananas...so this was certainly the perfect breakfast! In a medium bowl, combine the oats, 10-Grain Cereal baking powder and salt. Set aside. In another bowl, combine the brown sugar, milk, egg, vanilla extract and mashed bananas. Combine the wet ingredients with the dry ingredients. 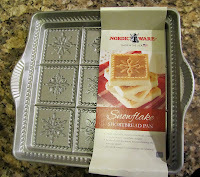 Lightly spray an 8 X 8 baking pan with cooking spray and pour in the mixture. Bake at 375° F. for 15 minutes. Sprinkle the walnuts on top and bake for another 5 minutes to toast them. 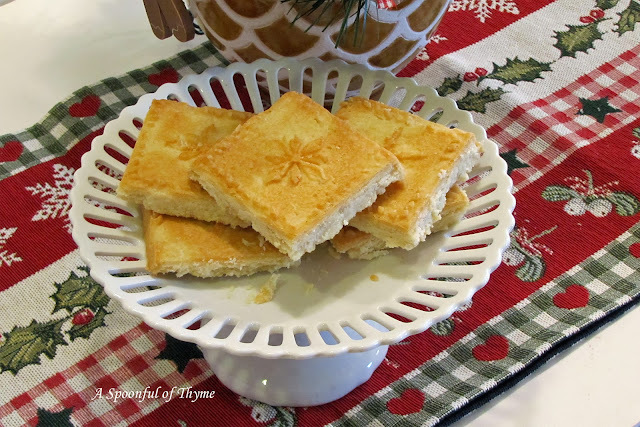 This would be a good bake to make when there is company in the house or for Thanksgiving morning...or any morning for that matter....it's delicious and easy! 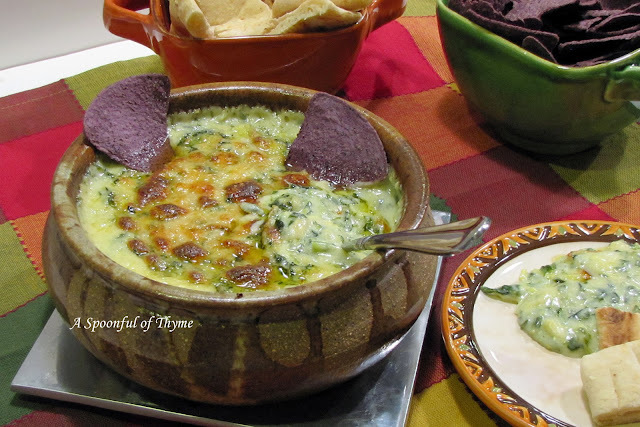 I remember the first time that I saw Spinach and Artichoke Dip on the restaurant menu. 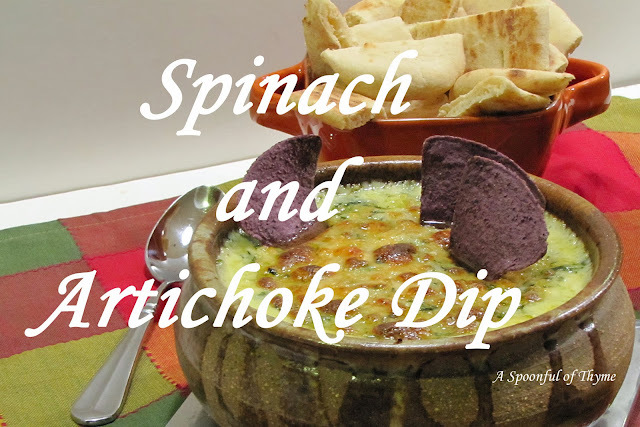 It sounded so good to me....hot, saucy, spinach and artichokes blended with cheese....not necessarily the most healthy of dips but one that is....wait, it has vegetables, it has to be a little healthy! Let's just forget the mayo, cream cheese, the gooey Parmesan cheese and whatever else is usually mixed in....I mean, really forget it...living in a state of denial allows one to truly savor each and every bite of those wonderful vegetables! Then there was the article from America's Test Kitchen that mentioned how the dip is sometimes floating in grease, bland and turns to rubber as it cools...yep, that describes the last time I ordered it. The Test Kitchens set forth to make a creamy dip that wasn't the least bit greasy or rubbery...it's made with a flour-thickened Parmesan and cream sauce....mmmm...mmmm...I adore Parmesan cheese....and they included hot sauce! So, yes, I made the dip...and yes, I lived in denial, and yes, I enjoyed every piece of naan spread with this warm and creamy concoction...and since I don't do this very often, I didn't worry about it! Adjust the oven rack to the middle position and heat to 450° F. Melt 2 tablespoons butter in a large skillet over medium-high heat. Cook the onion until softened, about 5 minutes. Add the artichokes and cook until lightly browned. about 5 minutes. Stir in the garlic and cook until fragrant, about 30 seconds. Set the pan aside. Melt the remaining butter in an empty saucepan. Stir in the flour and cook until just golden, about 1 minutes. Slowly stir in half-and-half, 1 1/4 cups Parmesan, lemon juice, hot sauce, and salt. Reduce heat to medium-low and simmer until thickened, about 3 minutes. Off heat, stir in the spinach and the reserved artichoke mixture. Transfer to a 1-quart baking dish and sprinkle with the remaining cheese. Bake until golden brown and bubbling, about 15 minutes. Cool 5 minutes and serve. This can be made ahead: The dip can be prepared to the point prior to baking and refrigerated in an airtight container for up to 24 hours. To heat, let the dip come to room temperature for 1 hour, them sprinkle with the cheese and bake, covered with foil for 10 minutes. Remove the foil and continue baking until golden brown and heated through, about 15 minutes longer. I must admit to not reading well...maybe it was the size of the print...whatever it was, I made an error and used all four tablespoons of butter when I browned the onion and artichokes....ooops....then I did it again when I used the entire measurement of the Parmesan when making the sauce...ooops....it still was wonderful!! So, what motivated me? It was actually The Secret Recipe Club and the blog I was assigned, Fit Mama Real Food. The blog is Heather's combination of fitness and healthy eating...along with some parenting tips and home projects. Heather is a fitness instructor and as such, has a passion for fitness. Her passion naturally carries her to the kitchen when she works her special magic creating healthful recipes to share with her family. Heather posted a Healthy Spinach Artichoke Dip using Greek yogurt and low fat cream cheese as her base....and this was the motivation for me to dig out my notes, make some comparisons and prepare the dip! I am back with another recipe by Yotam Ottolenghi and Sami Tamimi. 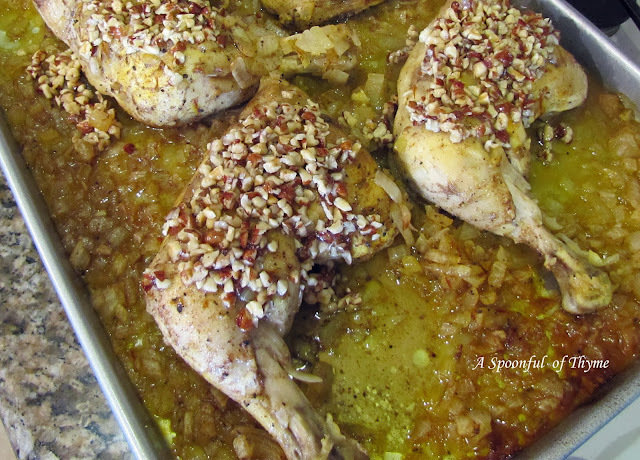 The recipe is for Roast Chicken with Saffron, Hazelnuts and Honey. It was part of the menu that I put together for our gourmet group. This recipe comes from their cookbook, Ottolenghi; The Cookbook. I have definitely placed this cookbook on the Christmas list....I know that I must have another cookbook to add to the library, especially one like this: packed with delicious recipes!! The only change I made was that I did not use a whole chicken. I used leg and thigh quarters and I skinned the pieces. Transfer the chicken and the marinade to a baking sheet large so that the chicken is not crowded. If you did not skin the chicken, arrange the pieces skin side up. Bake for 35 minutes. Transfer the chicken to a serving dish and garnish with the chopped green onions. I must admit I was worried about marinating the chicken when I didn't have much liquid...I wasn't taking into account that the onion would generate liquid....all was well, and it was a delicious meal. This is so easy and tasty that I can see it appearing on our table again and again....beside, what am I going to do with all of this rose water!! I am sharing at Full Plate Thursday hosted by Miz Helen's County Cottage and Foodie Friday hosted by Michael at Rattlebridge Farm. 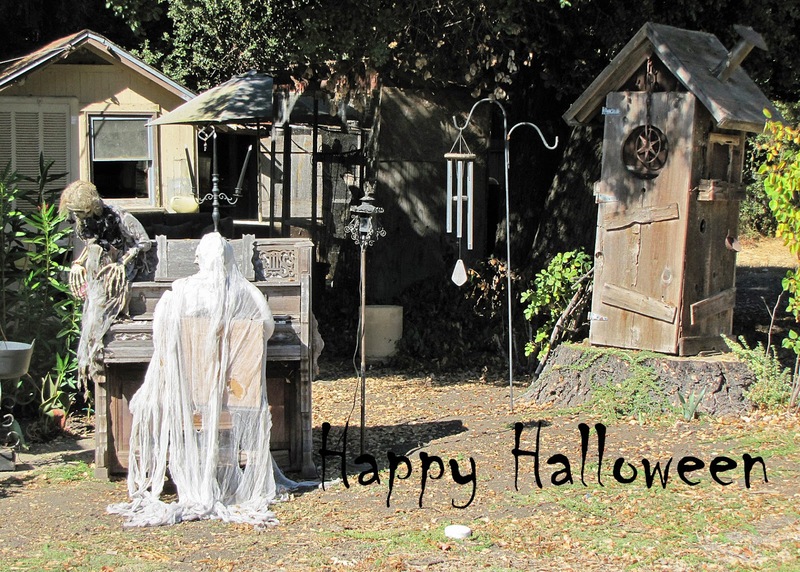 While traveling this weekend, I spied a front yard that offered a special look! I haven't participated in Outdoor Wednesday in a long time...but today I am sharing! I hope you have a splendidly haunting Halloween! Along with with the Israeli Zahtar Flatbread that was posted earlier, we served Aleppo Pepper Muhammara and Humus. when our gourmet group met. 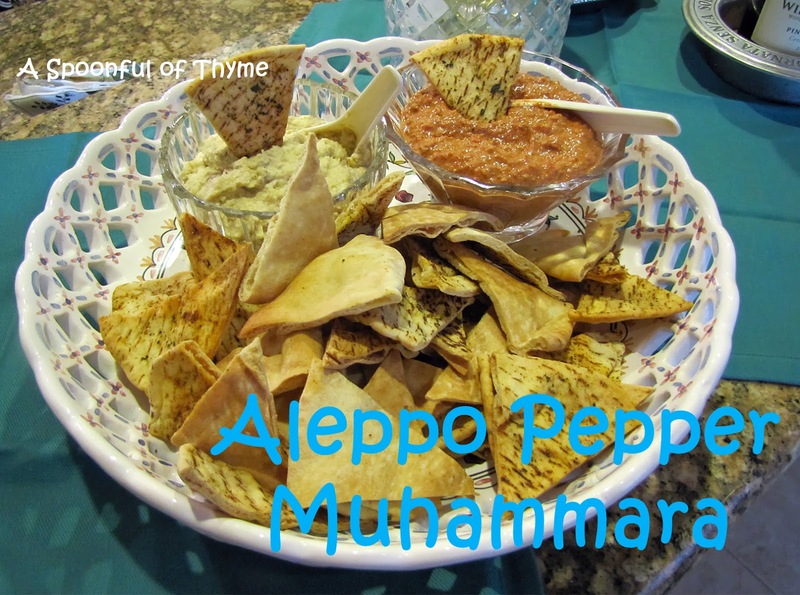 I immediately fell in love with the Aleppo Pepper Muhammara! I had no idea what a Muhammara was but I knew it had to be a good thing! So, what is Aleppo Pepper and what is Muhammara? An Aleppo Pepper is a type of chili pepper that is from Aleppo, Syria. It has a robust flavor and a moderate heat level. Aleppo Pepper flakes can be substituted for crushed red peppers. 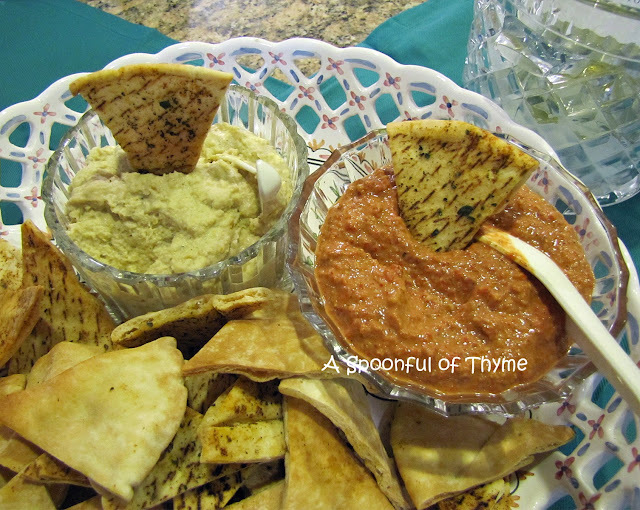 I loved the flavor and bit of spark it provided for the Muhammara. A Muhammara is a Middle Eastern dip mixture consisting primarily of roasted red peppers, walnuts and pomegranate molasses....a little garlic, lemon juice and of course, Aleppo Pepper flakes! It is served with toasted pita or crudities. In a food processor or blender, pulse the roasted walnuts until they are broken down into small pieces. Add the remaining ingredients and puree until smooth. 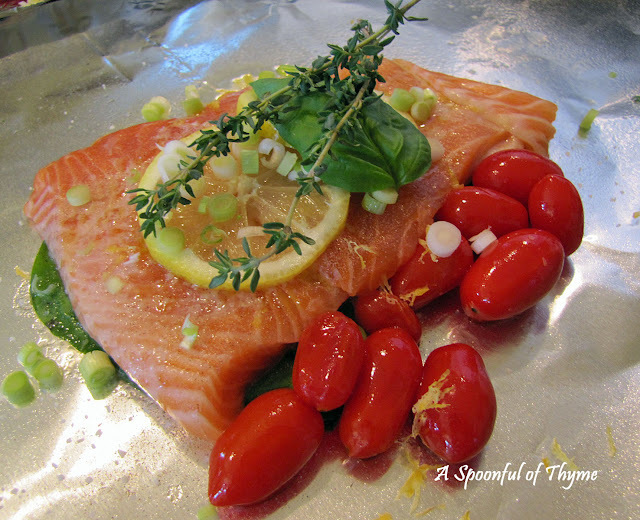 Taste for seasoning...you may wish to add additional salt, lemon juice or pomegranate molasses. Transfer to a serving bowl and serve with toasted pita chips. The Muhammara may be stored in the refrigerator for up to a week. It is apple season so, of course, we had to drive to the apple orchards...what a treat! The little town was having their Harvest Festival and was bursting with families enjoying the cool breezes, numerous booths and tasty food. 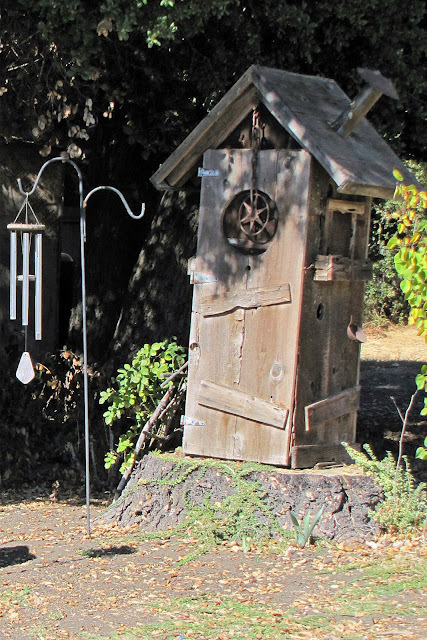 Small towns have a wonderful "feel" about them. On the breeze was a carefree feeling....a happiness....smiles....laughter....it was a great visit. We moved on down the lane to find the "perfect" apple orchard. Each one seems to have multiple varieties...it was a question of what kind do we want....I selected apples of each variety to put in the box...some for me and some for my mom. 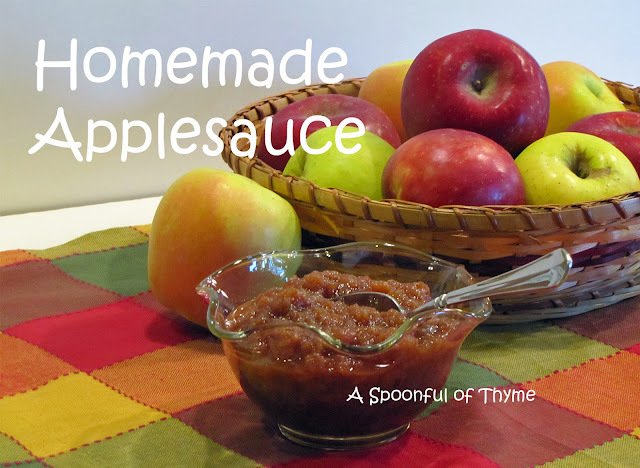 My mom used to make a large pot of homemade applesauce. 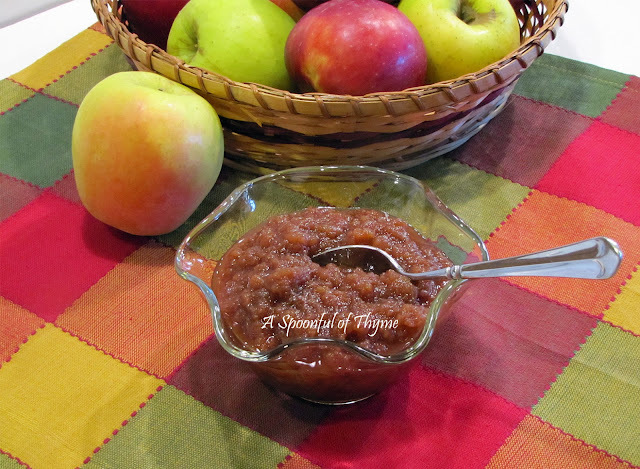 My brother and I loved those times...warm applesauce, with tiny little pieces of soft apple mixed in...lots of cinnamon...mmmm. Put all ingredients in the slow cooker. Cover and cook on low for 8-10 hours. Use a potato masher to get the desired consistency. I am sharing today at Full Plate Thursday hosted by Miz Helen's County Cottage and Foodie Friday hosted by Michael at Rattlebridge Farm. Lucky me! Lindsey did some cooking yesterday and shared....I have never eaten a corn fritter so this was a special treat. As promised, they were crisp on the outside yet soft and fluffy in the middle....how perfect is that! Thank you, daughter, for sharing! We do like a little "bite" to our treats so a jalapeño was chopped up fine and added to the mix...yum! Puree half of the corn in a blender and set aside. Mix the flour and the baking powder in a small bowl and set aside. In a large mixing bowl, beat the egg until fluffy. Pour in the milk and mix well. 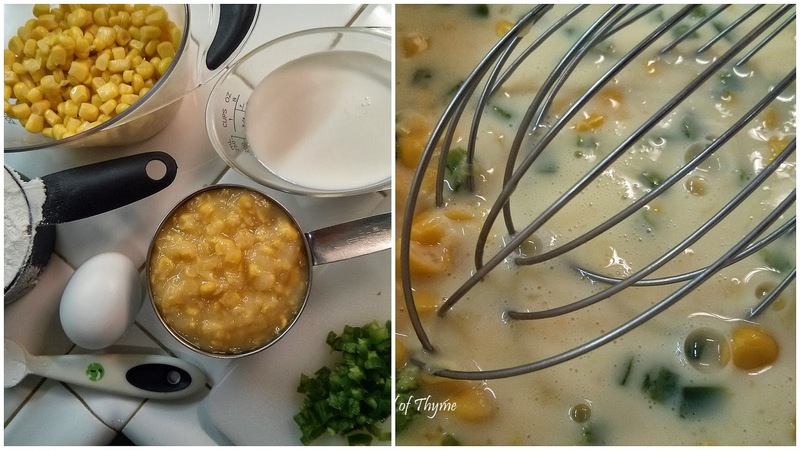 Add the corn puree and the remaining corn kernels and stir. Add the flour mixture and mix well. Season with salt and pepper. Heat the oil. When the oil is hot, fry the batter by the spoonful until golden brown. Drain the fritters on a paper towel and serve. Fritters may be served with hot sauce or Ranch dressing. 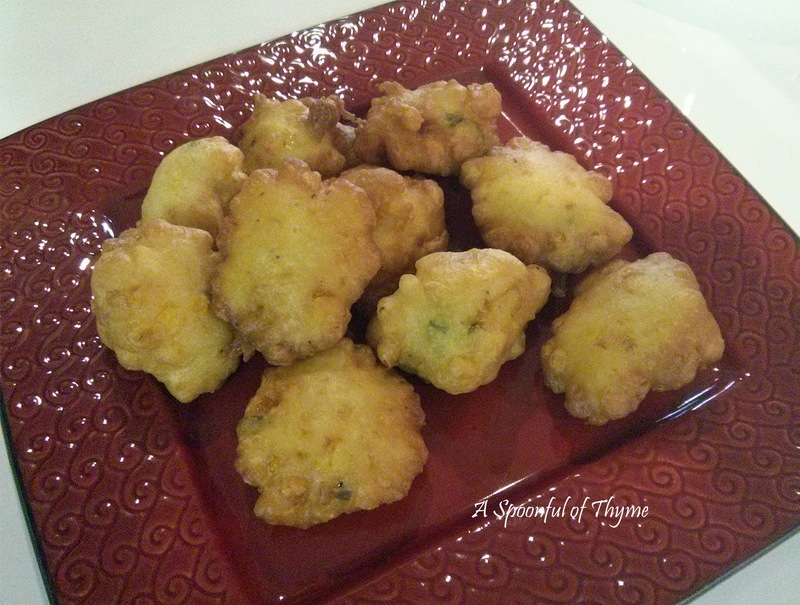 Thank you, Lindsey for sharing these tasty corn fritters!! Earlier I mentioned that I was going to use my new cookbook, Jerusalem, when I planned the menu for our next gourmet group. As I was ordering spices, from the World Spice Merchants in Seattle, I found this recipe that I could not resist adding to the menu. It was a hit!! 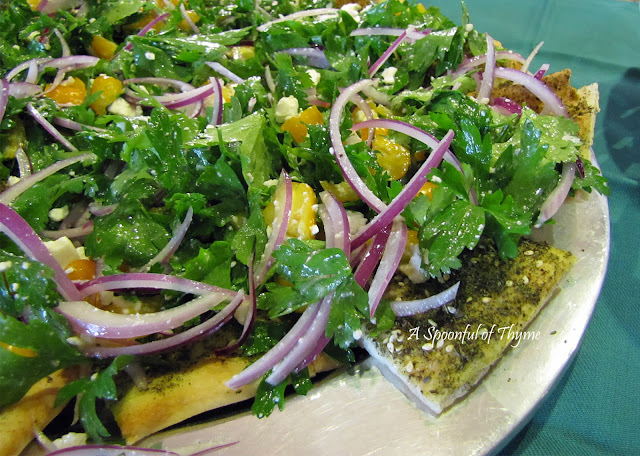 I loved the flavorful flatbread with a little salad of parsley and cilantro. I know that I will be making it again this fall to serve with soup...somehow, that really sounded like a great combination for a meal. But, wait, what is zahtar? First, it is spelled many ways: Zahtar, zatar, or za'atar. It means thyme in Arabic but in this instance refers to a blend of sumac, sesame seeds, salt and dried green herbs. The herb is usually thyme but sometimes oregano, marjoram or parsley is used. Zahtar is a coarsely ground table condiment in the Middle East. It is most often sprinkled on or cooked with meat or vegetable dishes. And, not to worry, the sumac which is the dominant ingredient in zahtar, is not the poison sumac!! This sumac is from the dark-red berries of a shrubby tree native to the Middle East and parts of Italy. It has a tart, fruity, and lemony flavor. A perfect topping for this flatbread! Divide into 3 portions and roll them out thinly. By rolling the dough into long ovals, and not rounds, they can all fit onto one baking sheet and they will cook more evenly. Brush the baking sheet with the olive oil and place the dough on it, without any of the sides touching. 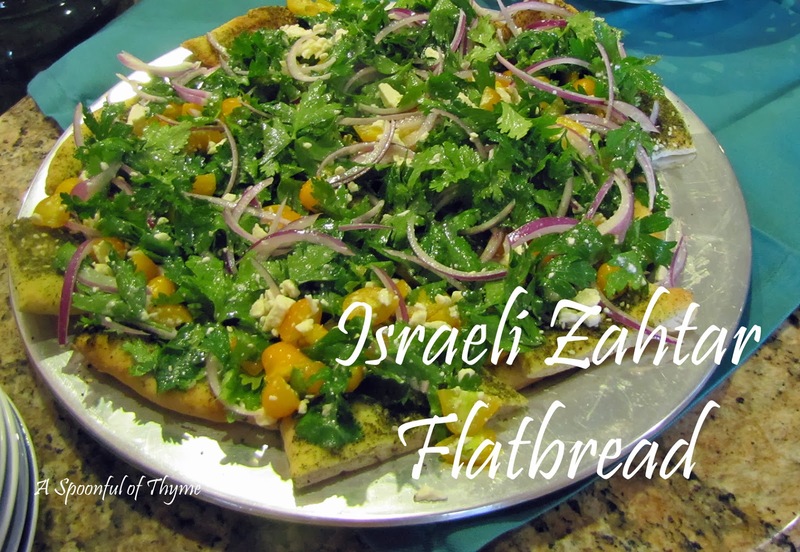 Brush the dough with olive oil and sprinkle on the Israeli Zahtar. Bake in the oven until the crust is golden brown and cooked through. Since there is only oil and spice on the dough, keep an eye on it so that it doesn't burn. While the flatbread is baking, make the salad for the top of the flatbread. Combine the rest of the ingredients (except for the lemon juice and olive oil), mixing well. When the flatbread is done, remove from the oven. It will be easier (and less messy) to cut the flatbread into pieces before topping with the salad. Put the cut wedges on a serving platter. Add the lemon juice and 2 tablespoons olive oil to the salad and toss to coat. Evenly top the flatbread with the salad. Additional olive oil my abe drizzled on top before serving. If you are ever in the Seattle area you won't want to miss stopping by the World Spice Merchants. They have a wonderful selection....and their turn-around time is great. 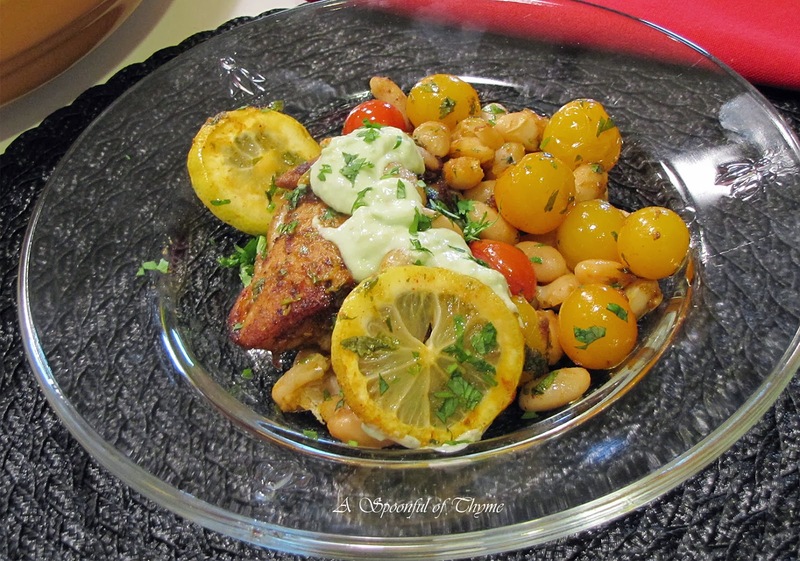 From the moment I saw the post for Mediterranean Roasted Chicken Breasts with Tomatoes and Cannellini Beans at The Cafe Sucre Farine, I knew I was going to make this dish. Chris is an absolutely wonderful cook....not only did the ingredient list have me salivating, but her artistic presentation was...well...gorgeous! A true homerun in my book. If you have never visited Chris, do hop on over....you will love it! I did make a tiny change to the recipe...I used chicken thighs instead of breasts and we always take the skin off. Mix together the olive oil and the next eight ingredients (spices) in a small bowl. Rub each piece of chicken with about 2 teaspoons of the olive oil/spice mixture. Heat 1 tablespoon of olive oil in a large saute pan. Place the chicken in the heated pan and saute for several minutes until golden brown. 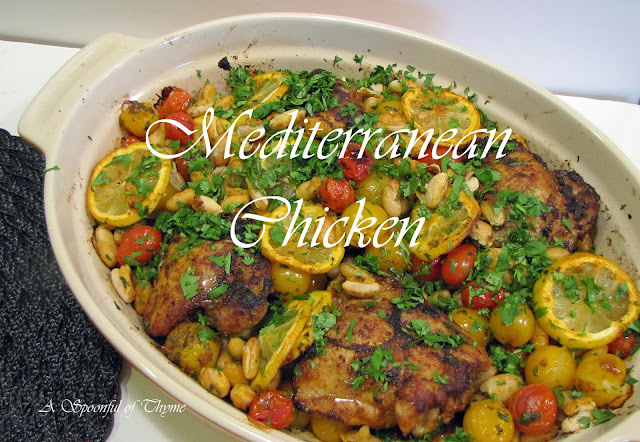 Remove from pan and place in a large oven-safe dish. In a large bowl, combine the remaining olive oil and spice mixture with the beans, tomatoes, lemon slices, and 1/2 cup cilantro. Stir gently to coat. Add this mixture to the baking dish with the chicken, surrounding the chicken, but not covering it. (I have to admit to some of this mixture getting under the chicken!) Sprinkle lightly with salt and pepper. Roast until the chicken is cooked through, about 20-25 minutes. Sprinkle with the remaining 1/2 cup cilantro. Serve with reek yogurt sauce. Combine all ingredients. If preparing ahead, cover with plastic wrap and refrigerate. This was so very good...I mentioned to a friend that it reminded me of the flavor of the giant beans and chicken that we had when we were at the Restaurant Meteora in Kalampaka, Greece. 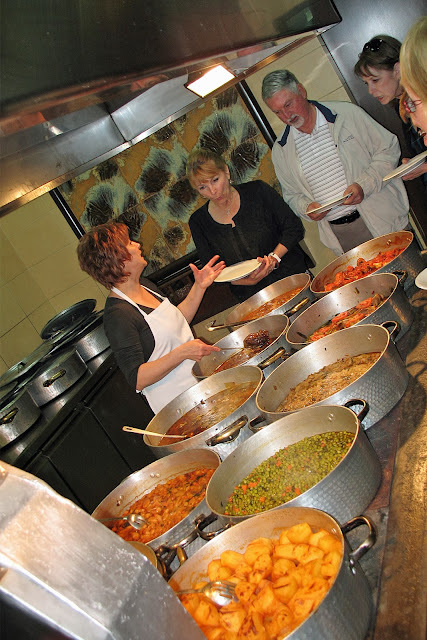 We walked through the kitchen and selected our meal from the pans of prepared food...so many choices...so fragrant and delicious! After eating our fill, we went outside and traveled to the Monasteries of Meteora...they were amazing. 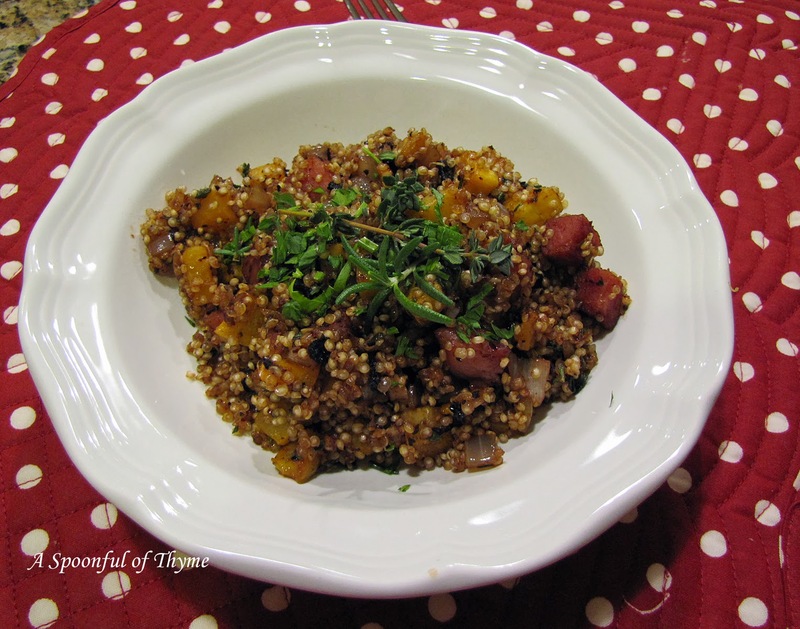 This dish brought back all kinds of memories....thank you, Chris, for sharing your recipe! !